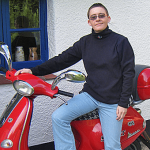 Alice Dryden had a brief encounter with the C 650 GT and its sibling, the C 600 Sport. Both have the same engine with the same specifications, so it’s not clear why BMW calls one a 600 and the other a 650. The differences are confined to the bodywork and slightly different dimensions, along with a 12 kg weight difference in the C 600 Sport’s favor. The C 650 GT also comes with a few extra features and a more comprehensive instrument display. 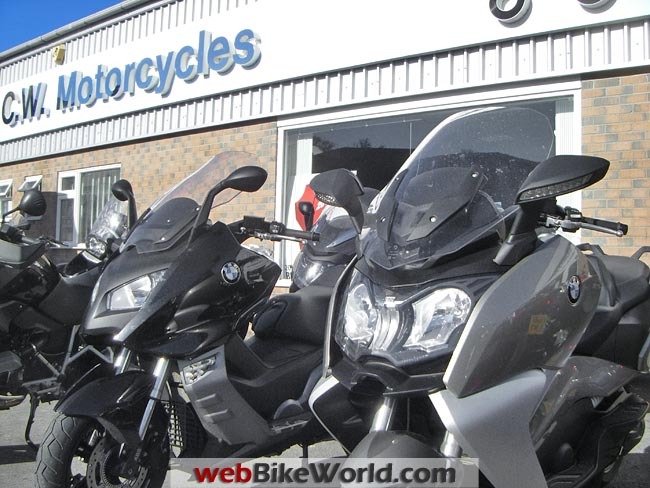 Around the time webBikeWorld Editor Rick was collecting his new toy, the BMW C 650 GT (review), I was trying one out on the other side of the pond. 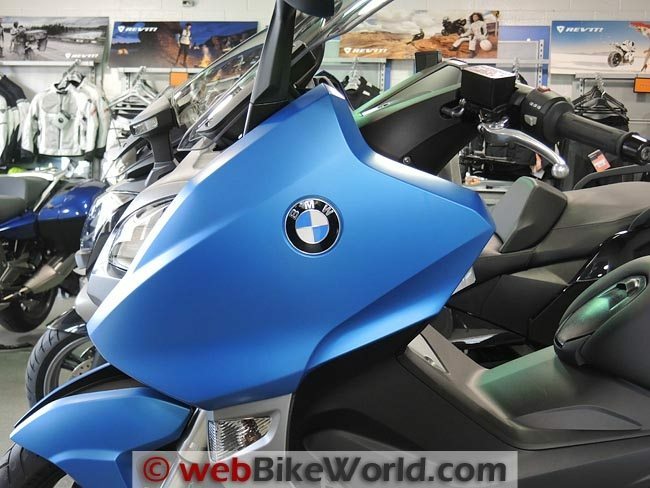 First seen at EICMA 2010 (report), BMW’s brace of new maxi-scooters, the C 600 Sport and C 650 GT tourer, were originally scheduled to launch in the UK in April. They eventually arrived at the dealerships on September 1st. 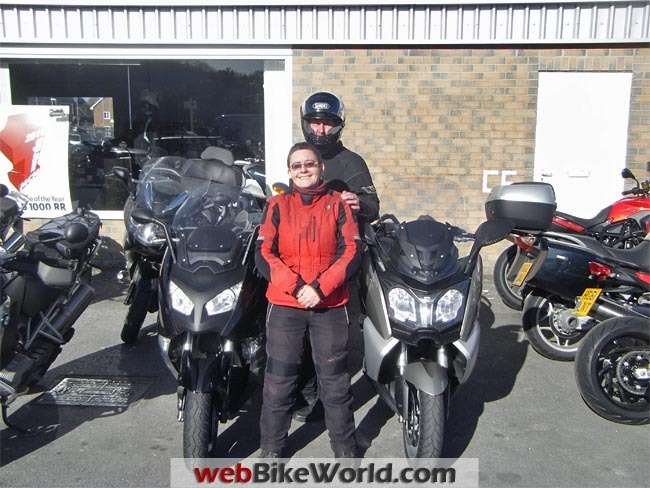 CW Motorcycles in Dorchester had both models available for testing, so my partner H and I went along to try them out. This would be an interesting exercise; my motorcycling career has been on scooters exclusively (I currently ride a Gilera GP800), while H is a geared bike rider whose last scooter experience was a loan of my 200cc Vespa. He’s also nearly a foot taller than my puny 5’2″. What would we both make of the scooters? 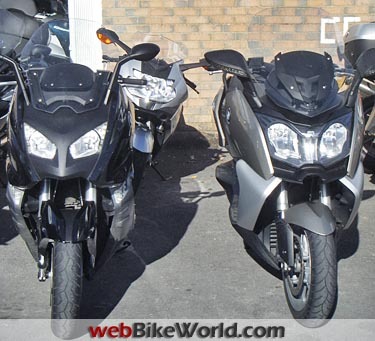 Despite their names, both the C 600 Sport and the 650 GT use the same 647 cc engine and the differences between the two models are mostly cosmetic. The GT has a chunkier appearance — big mirrors with integral indicators, LED parking lights in the nose and a tail light/indicator cluster at the back. The Sport has a tapered tail and tiny but effective rear indicators. We didn’t perform a pillion test on either, but the GT’s footboards looked marginally more comfortable for a passenger than the ‘pegs on the Sport. 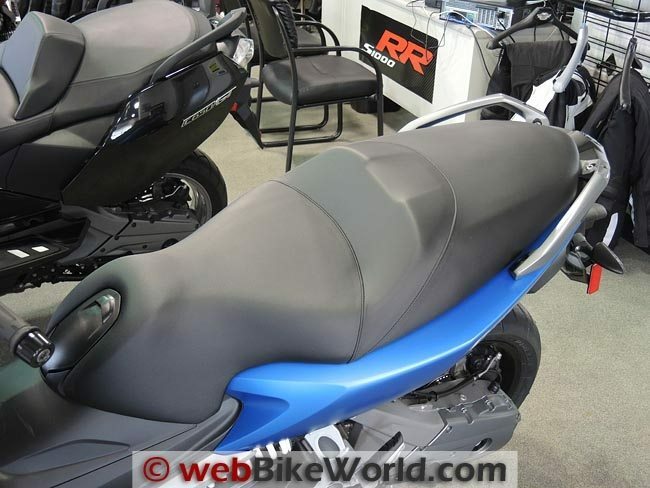 Both models are available with heated grips and seat, but the GT with its electric screen has a slight edge on the gadget front. Its underseat storage area is roomier, too, although the Sport features a unique pop-down compartment which can store a helmet when the bike is stationary (the engine will not start if the compartment is in the down position; I can just imagine getting caught out and summoning the breakdown van!). My flip-front helmet fitted snugly in both scooters, as it should — it’s made by BMW! 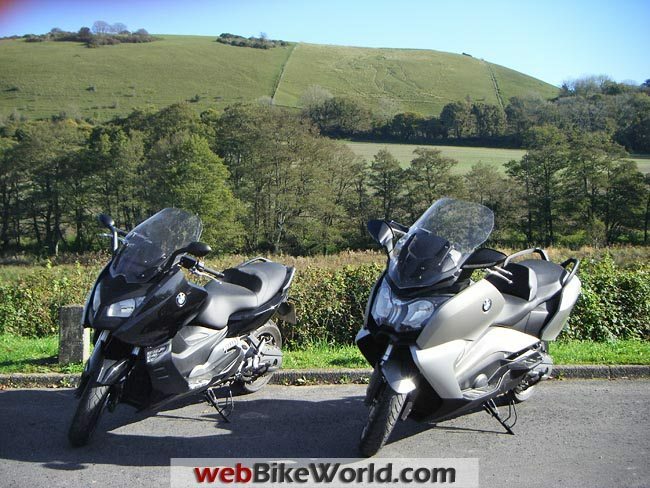 BMW C 600 Sport on the left; BMW C 650 GT on the right. I decided to ride the rather lighter C 600 Sport first (249 kg compared with 261 kg for the GT), and followed H’s lead out of the industrial area. I could tell he was having slight difficulty with the different weight distribution and handling of the big automatic, though by the time we left Dorchester he had got the hang of it. On my part, I was finding the high seat disconcerting when I needed to stop and put a foot down, but the maxi in motion was a delight. We were headed for Cerne Abbas and its hillside fertility symbol, the Cerne Abbas Giant, where we planned to take some photos and swap bikes for the return journey. Our hour-long excursion encompassed fast A roads, twisty lanes and dual carriageway, through countryside, villages and a busy town centre. As we hit the country roads, I found the Sport’s suspension was perhaps a little too sporty for my tastes; I could feel every bump in the surface. The digital dashboard, which glows a street-lamp orange in the dark, was crowded, the information confusing, and the small digits were hard to read. 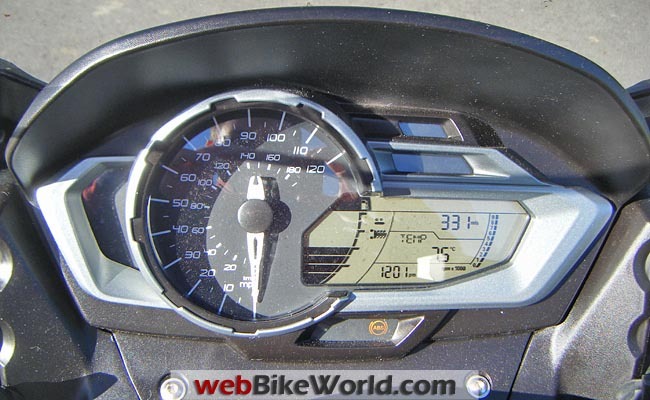 However, the analogue speedo, with its big white needle, was very clear — and what else do you need? A rev counter on a scooter is an affectation, really. 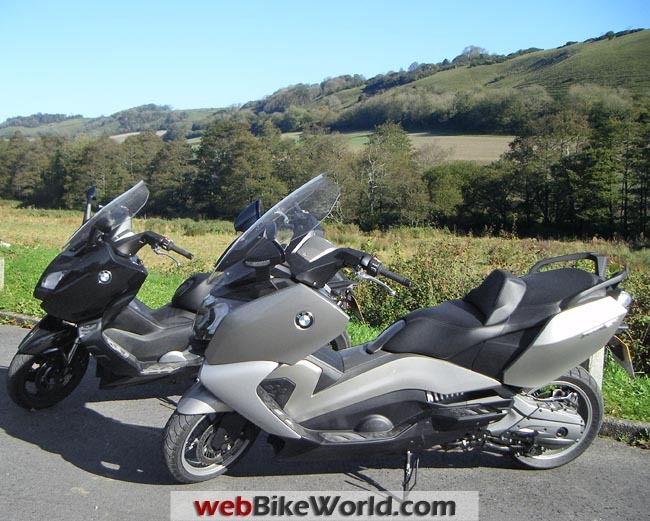 Rear view of the BMW C 650 GT (L) and BMW C 600 Sport (R). BMW C 650 GT in the foreground. I soon gained confidence in cornering and acceleration, and performed some snappy overtakes. Although bright and sunny, it was the coldest day of autumn so far, and I was looking forward to trying out the heating. I found the Warm setting on the grips was ample, but I turned the seat heat to maximum and still barely noticed it. This could be to do with my riding position, perched on the tip of the saddle, since H remarked upon the benefits of the hot seat. He used the Auto setting, while I, as a chilly soul, went for the always-on option. When I switched bikes, I immediately noticed that the ride on the GT was much softer and more to my liking. The seat is marginally lower at 795 mm (810 mm on the Sport), so I was expecting an easier time putting my feet down, but I didn’t notice any difference. Although the Sport’s throttle was responsive, I was surprised to reach the stop when overtaking; the GT seemed to keep a little more in reserve. The top speed on both was impressive; if it were legal to do so I might well have seen 100 mph on the GT’s speedo before getting scared and throttling back, while H might have claimed 110 on the Sport. Obviously nothing of the sort happened. I got to test the brakes on the GT when a van driver pulled out of a side road without looking. Deceleration was quick and controlled, and although it felt like an emergency stop to me, it wasn’t enough to activate the ABS. This seems like a good place to mention that the side stand acts as a parking brake; the wheels won’t turn with the stand down. It’s a nifty idea, though I like to have the side stand down as a precaution when I roll heavier bikes off the centre stand. H is a sports bike rider while I look for commuter/tourer qualities, yet at the end of the ride we both expressed a preference for the GT touring model. I found it a smoother and more stable ride overall, and appreciated the shelter of the large screen and the excellent view afforded by the huge mirrors. Instrumentation on the C 600 Sport is slightly different from the C 650 GT. Our intrepid scooterist and “H”. wBW Slide Show: Click on a photo to start the Lightbox slide show. So what did my partner make of his first maxi-scooter experience? 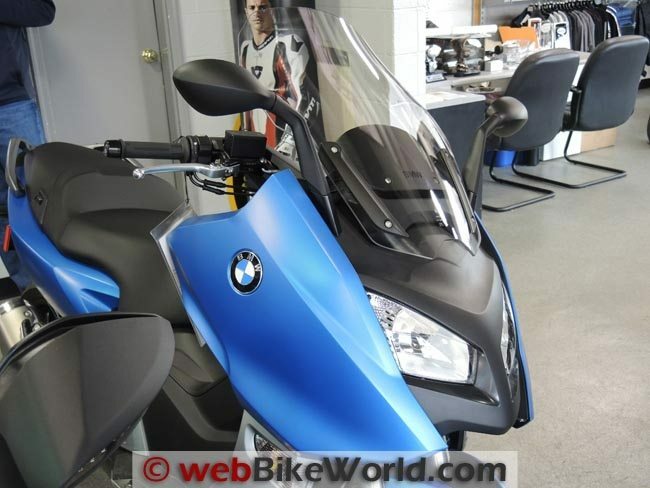 The BMW scooters “exceeded expectations”. Once he got used to the lack of clutch, he found low speed control with the throttle nice and easy. The riding position was fine, the quick acceleration a hit, and while he didn’t feel the scooters would corner as well as the bikes he’s used to, he admitted that might change with a little practice. The only thing he claimed to find difficult was pushing the bike around, which was deputised to me as the expert in scooter parking. H may not be quite ready to give up a lifetime of geared bikes, but he had a lot of fun with the BMWs and would gleefully take one as a loan bike for the day. As for me, the scooter rider, I had a blast too. Despite its height and weight, the BMW is perhaps the easiest maxi to handle of those I’ve tried. 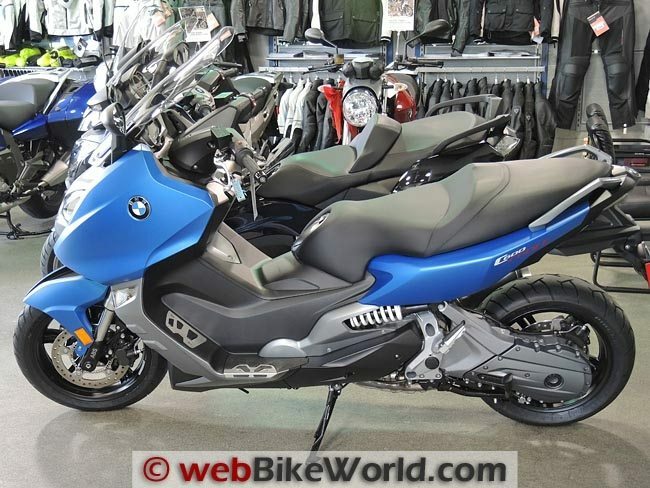 The wheelbase is shorter than my Gilera’s, and the BMW just seemed to carry its load better. 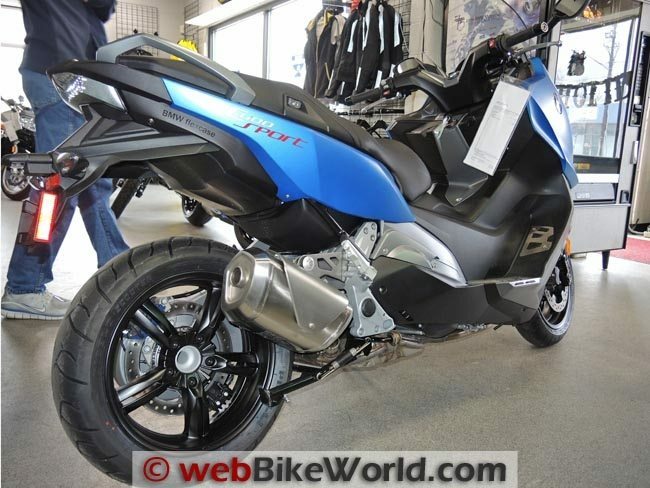 It also, to my eyes, has visual appeal over and above its nearest equivalents, Suzuki’s 650cc Burgman and Yamaha’s TMax. I’d definitely put the C 650 GT on my Christmas list. In Vermilion Red Metallic, please! From “J.W.T.” (January 2013): “I have purchased the C600, The recall I sent you previously has been repaired on my bike and it was released to me today. Since I traded in my 2011 Burgman 650 Exec, test-riding the GT and now owning the C 600 Sort, I think I have a good idea that I have what I want. 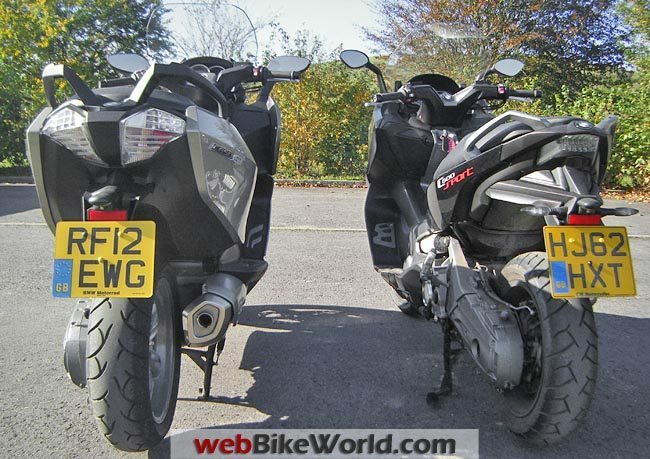 The Burgman and the GT are quite similar in wind protection from the fairing and windscreen. 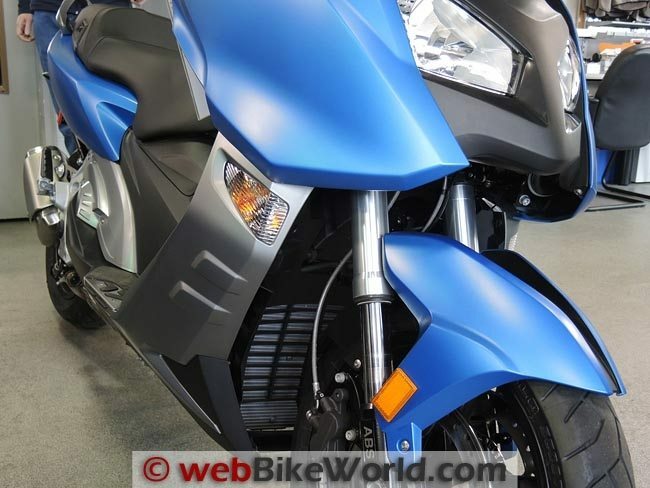 The Sport windscreen does well, and the fairing is less protective, I could feel the wind, just barely, when sitting in a relaxed sitting position. Bringing the knees slightly closer together in the cold (35 F) degree air. This doesn’t bother me as I really want the sportier appearance and handling. Weather it is just in the mind or ergonomics, the handling seems much more sport-like and flick able from one lane to another. Once you are over 20mph and 3/4 throttle, you feel a good pull from the engine propelling you to 60 very quickly. I can see a Malossi or Dr. Pully kit to make off the line faster still. I opted for the Blue, I am tired of gray, white and black as the only options. In the daylight the blue pops quite nicely. I also notice that the access to the CVT is much easier to get to on the sport, two panels cover the area. One the Burgman, you either need to be able to work upside-down, or take 90% of the plastic off. In addition, everything on the BMW’s is on one side, where as the Burgman has the clutch on one side and CVT on the other. I think the Burgman style is close to the GT’s way of maintenance access.